Editors of Fungal Biology and Biotechnology recently attended the 14th European Conference on Fungal Genetics in Haifa, Israel. We invited young scientists who presented excellent posters at the conference to tell us more about their research. In this blog, we hear from Jillian Romsdahl, Freek Appels and Sara Cea-Sánchez about their work. Fungal communities will accompany us into space, but how will the environment effect them? On each individual there exists diverse fungal communities that will, without question, accompany us as we travel to Mars and beyond. Through adaptation, these microorganisms possess the capacity to thrive in a wide variety of ecological niches. Studies suggest that the spacecraft environment, which is characterized by microgravity and high-energy radiation, can alter an array of microbial physiological processes, including virulence and antimicrobial resistance. Additionally, fungi produce a myriad of bioactive secondary metabolites in response to environmental stressors, ranging from potential therapeutics to toxins. The ISS isolate exhibited an increased rate of growth compared to a terrestrial strain. Studying fungal isolates that have adapted to spacecraft environments, such as the International Space Station (ISS), may provide information important for maintaining astronauts’ health or eradicating problematic microorganisms during long-term manned missions. My Ph.D. research project involves using a combination of genomics, proteomics and metabolomics to characterize the molecular phenotype of Aspergillus niger, a melanized fungal species, isolated from the ISS. The ISS isolate exhibited an increased rate of growth compared to a terrestrial strain. Whole-genome sequencing revealed increased genetic variance when compared to several other genome sequenced strains of A. niger. Additionally, a distinct molecular phenotype of the ISS isolate was observed that suggests increased resistance to radiation and oxidative stress, and an enhanced ability to acquire nutrients. Increased production levels of therapeutically relevant secondary metabolites were also observed. These findings provide insight into the adaptive evolutionary mechanism of melanized fungal species and enhance our understanding of host-microbe interactions in closed systems. Further, they demonstrate the need for more studies on the biological alterations of microbes adapted to extreme spaceflight environments. 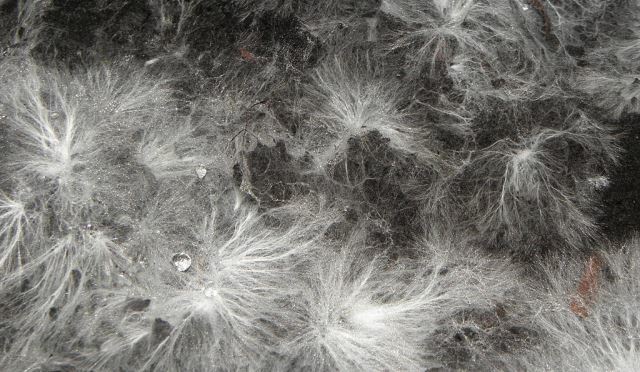 Mycelium, the interwoven network of fungal filamentous cells called hyphae, can be used to develop materials. My name is Freek Appels and I am a third year PhD-student in the lab of Han Wösten at Utrecht University. In my research I study how we can use fungi in order to convert to a more sustainable economy. This research is done together with artists, designers and scientists like me, as we can learn a great deal from each other, looking at the world through different glasses. An innovative approach is the use of mycelium for the development of materials. Mycelium is an interwoven network of fungal filamentous cells called hyphae. Fungi form these mycelia grow on a wide variety of organic substrates; the beauty here is that these organic substrates can originate from low quality waste streams from the agricultural industry. By colonizing these waste streams, fungi turn it into high quality materials that can be used to produce numerous products, from isolation materials to panels with high acoustic absorbance. Deletion of sc3 lead to an increase in Young’s modulus (meaning less elastic properties) and strength of the material. We studied the impact of environmental growth conditions and deletion of the hydrophobin gene sc3 on material properties of the mycelium of the mushroom forming fungus Schizophyllum commune. Changing growth from dark to light and from ambient to high CO2 (7%) had an influence on the material properties; however, the exact mechanism behind these findings remains to be elaborated. Deletion of sc3 lead to an increase in Young’s modulus (meaning less elastic properties) and strength of the material. We studied the chemical composition of the fungal material using infrared spectroscopy and did not find differences in macromolecule composition, like polysaccharides. What we did find was that the density of the material highly correlated with the material properties that we tested. This increase in density of the material can be well observed with the SEM pictures of the material. Designers, artists, producers and end-users will explore the potential of the materials and will provide feedback how to improve the properties of the mycelium. This should result in tailor-made mycelia for innovative design solutions and new concepts of sustainable materials. The filamentous fungus Neurospora crassa is often observed in recently burnt vegetation and its life cycle has a sexual and an asexual stage. Environmental signals such as exposure to air and light promote the development of aerial hyphae and asexual spores (conidia) that are easily dispersed by air currents, allowing the colonization of new niches and recovering natural habitats after a fire. A circadian clock regulates several aspects of the biology of this fungus, including asexual reproduction. N. crassa has been extensively used as a model for photobiology as several developmental processes in this microorganism are under blue light control. The velvet family of regulatory proteins is highly conserved among fungi. All the velvet proteins contain a fungal-specific velvet domain with a DNA binding domain, presumably for gene regulation. The Aspergillus nidulans velvet protein VeA plays a key role in coordinating the synthesis of secondary metabolites (very often fungal toxins) and the regulation of the reproductive programs, and its localization in the cell is regulated by light. Our results suggest an important role of VE-1 as a regulator during conidiation. Knowledge of the VeA protein in N. crassa (VE-1) is limited. A strain with a deletion of ve-1 has defects in aerial hyphal growth but increased conidiation. In order to characterize the potential transcriptional regulatory role of VE-1 we have performed RNAseq analysis of the N. crassa wild type and ∆ve-1 mutant grown in the dark or exposed to light. In addition, we have analyzed the transcriptome of the two strains as they progress from vegetative growth to conidiation. We found significant differences in the gene expression profile between the two strains with a higher enrichment of deregulated genes in the wild type (2784 up and down regulated genes) compared to the mutant (1013 up and down regulated genes) during conidiation. Our results suggest an important role of VE-1 as a regulator during conidiation. We have identified interesting target genes in the data sets for further analysis and this will hopefully allow us to understand better the role of VE-1 in the regulation of the asexual development.